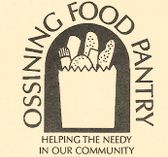 Ossining Food Pantry | Your generous donation will help to feed hungry families in Ossining, New York. Your generous donation will help to feed hungry families in Ossining, New York. Our clients include single people, couples, parents with children, senior citizens struggling to get by on Social Security, the unemployed, the working poor, individuals returning to society after incarceration, veterans, the sick who cannot work and the well who cannot make ends meet under current circumstances. They can be men, women or children, young or old, new to our community or long-time residents. Donate 100% - Add 3% so that 100% of the donation goes to Ossining Food Pantry. Ossining Food Pantry has partnered with Network for Good to securely process your online credit card payment via Network for Good (tax ID 68-0480736). This transaction will appear on your credit card statement as "Network for Good." This transaction is subject to Network for Good’s Privacy, Security & Disclosure Statement and the Charitable Solicitation Disclosure.